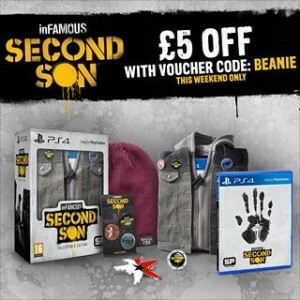 The Collector’s Edition for Sucker Punch Productions’ upcoming PS4 game Infamous: Second Son is £5.00 off this weekend only at GAME. Enter the code BEANIE at checkout to receive your discount. The Collector’s Edition comes with the game, a game case in the form of a jacket like the one Delsin wears, a collectible coin, a bottle opener, badges, a replica beanie hat, the Cole’s Legacy DLC, & the Legendary Vest DLC. Infamous: Second Son is scheduled to be released on March 21st.